One of the area that has been hardest for me to green is my workplace. I work in healthcare so there is a lot of inherent waste and plastic use to help keep patients healthy and alive. I've made peace with that. Its a little hard to reconcile freaking out over a straw versus trashing a liter of fluid because the medication expired, but there aren't great alternatives for IV fluids, but there are great plastic free alternatives to straws. Anyway, my job has transitioned to more of an office job so there are great tips for that, but hopefully there will be some tips for everyone in almost any work setting. So what have I done to green my office? I don't have a trash can. Now this isn't to say I don't ever throw away things, but I just don't have a trash can in my office. Our custodians line the trash cans with plastic bags and then come in on a daily basis to change the liner. The would empty it even if it only had one thing in it. I work in an office that has one entryway and 4 offices. Each person has their own under desk trash AND the entryway has a huge thigh high trash can. I decided that I didn't need a trash can in my office. If I needed to throw something away I could walk the 5 steps to the entryway trash. The extra steps are good for me anyway. I try to limit what I print as much as possible, but there are reports and documents we just need to have hard copies of. So, I try to print double sided. If it's something that's just for me to read, like an article, I'll print it double sided and two per page. 4 pages on one sheet! advertising fees by advertising or linking to certain products and/or services. I save single sided sheets. Any paper I run across through the course of a day that doesn't have patient information on it and is only printed on one side gets saved. Right now I have a huge stack that I can print on. For a while I was printing double sided when it was more than 2 pages long, but now I realize that is still using "fresh" paper, so I'm trying to use salvaged paper and print on the back. I would be better about this, but the printer I use isn't my own. It's in the entryway office so anyone can print to it. People who are printing formal reports may not like the fact their report now has someone else's information on the back of it! So, since I have to remember to swap it out before I hit print, sometimes I forget. When I do, though I save it so I can print on the back of it later. I cut papers up to turn into a notepad. I take little notes all throughout the day. Before I started this zero waste journey I would use post-it notes. I realized that most of the time I didn't need to "post" it anywhere so that sticky side was just an added cost. So remember all of that single sided printed paper I had? I turned it into a notepad. I would cut the papers in half lengthwise for a long list or quarter the paper for shorter lists. I would just keep them paper clipped in the corner and they were available to me when I needed handy notes. This worked great for a while, but I've since moved to another method that saves even more paper. I use a dry erase board. I realized that most of my notes were things that I only needed for a few minutes or hours: A phone number while listening to messages, a quick to-do list that I would accomplish that day. So I decided to buy a dry erase board for notes like that. I purchased one that was a little bit smaller than an 8.5 x 11 piece of paper. It is awesome and in so glad it has been introduced to my work flow. The top half usually has my to do list or other projects while the bottom is open and can be used to scribble temporary notes. One of the advantages is that patient information can just be erased rather than go to the shred bin. Want to remember these for later? Don't forget to Pin it! I feel paperclips have several advantages over staples (and one disadvantage). First paperclips are designed to be reusable. They will keep paperwork together and then when you no longer need it you can just take it off and keep it for your next project. Ever try to reuse a staple? Next, paperclips do not alter the page. I hate it when the information I need it stapled to the street in front of it. Or it's damaged so I can't read it due to the staple placement. The biggest negative is that paperclips can move or get displaced, so there is a small risk of your stack coming apart. Binder clips are a better option if this is a concern and binder clips come in all sorts of sizes and colors. Some even have cute designs! Don't worry paperclips can come in fun colors too! The one area I'd like to improve is recycling. I was happy to hear that the paper that goes into the shred bin is recycled. I wasn't sure what the best course of action is with paper that didn't have patient information on it. I wasn't quite ready to be carting home reams of paper to recycle, but now that I know it is recycled I'm going to make sure all paper goes in there. Next, I'm going to talk to the purchaser of our paper products and see if we are buying paper made from recycled paper. That way I know we are doing the best we can. Enough with the paperwork, hopefully your job deals with with less paper then mine and there are still ways to be more environmentally friendly. Someone tipped me to this several months ago and I've been doing it ever since. I just hit "shut down" as I was leaving for the night rather than "log off". Then in the morning I'd hit the power button and have to wait less than a minute longer for it to turn on. Let's pretend you are only at work for 40 hours (funny, I know), but that means there are 128 hours a week you aren't at work and your computer doesn't need to be on. If everyone would turn off their computer when they leave for the night it would save a ton of power. I started by just shutting it down over the weekend, but quickly realized that it was easy enough to just turn off every night. Unfortunately about 3 weeks ago they swapped out my laptop at work and I've been noticing that it is on when I come into work. I keep forgetting to be patient and investigate if it is an issue with the computer not shutting down all the way at night. I usually hit the shut down button, turn off the light, and race out of the office. When I spoke with a guy at IT and he thought it might be that the IT department may be forcing it to wake up during the night for updates. So I might not be saving as much energy as you, but I'm still doing better than I would otherwise. I try to bring mine at least half of the time. But unfortunately that still means I eat food from the cafeteria half the time. My cafeteria serve food in Styrofoam to go containers and plastic silverware. It drives me crazy and most of the reason why I made taking my lunch to work a green resolution. Having silverware at work, (as silverware kit), allows me to avoid even more plastic cutlery . One time I had forgot my silverware kit in the office and I was being lazy and didn't want to walk back. I asked the cafeteria worker if they had any metal silverware and they did! So it never hurts to ask. Stock up the kitchen with reusables. Does your job have a kitchen area? Stock plates, mugs and silverware for when there are birthdays and potlucks. It will reduce disposable items that are used. We also make sure that we have a scrub brush and dish soap available to wash.Get thrift store mugs to keep instead of buying coffee with disposable cups. 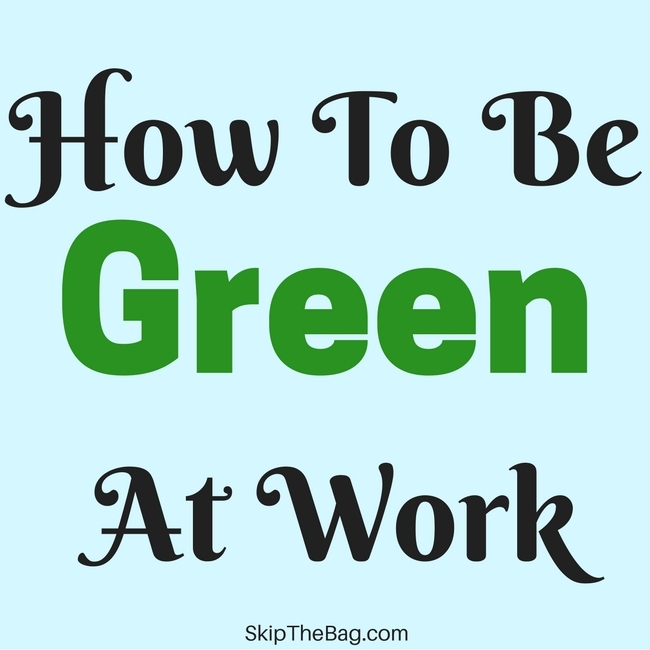 Have you started any green initiatives at work? Looking to make an impact in the bathroom? 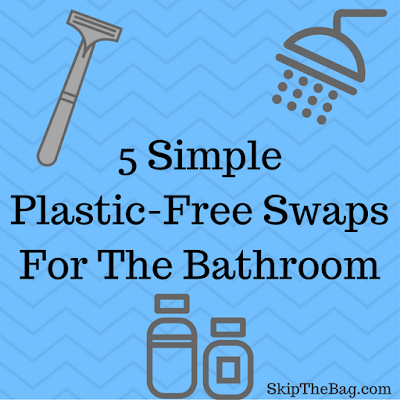 Have you tackled these 5 simple plastic free swaps? 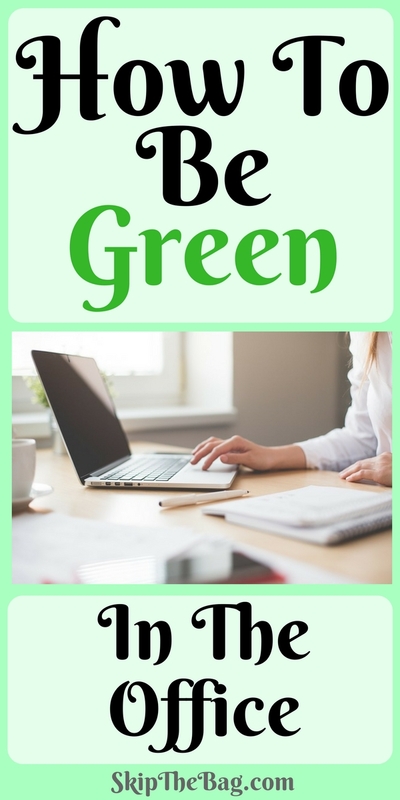 Great tips for going green at the office. Sometimes its hard to control, especially if you work at bigger company, the waste, but your ideas are feasible and can make a substantial difference. Bringing your lunch to work is has many benefits - you know what are eating and you its not unhealthy junk food and it saves you a lot of money. Sharing on twitter & pinning.Visiting from #WasteLessWednesday ! There are so many benefits to bringing your own lunch! Thanks for sharing! Ha! It was probably from you then. I couldn't remember where I heard the idea. The day I heard it I removed my trash can so I've been doing it for over a year now. Thanks for the idea! at my moms work they all have their own reusable plates and silverware for potlucks. that way no one ever has to provide paper plates and plastic silverware. it's really handy because they have potlucks every two to three weeks there! everyone just washes their own dish, it is really cool! These are some great ways to save paper and to do your bit to help the world and its deteriorating state. I also recycle weekly but i think i will be applying these tips in my workplace! thanks for the share!